It is no secret that I have a sweet tooth. Santa can keep his milk and cookies because nothing is better than a decadent dessert with just the right dessert wine pairing. One of my favorites is a fortified dessert wine called Pedro Ximenez (pādrō himāniz or just cheat and call it “PX”). This is the name of a grape and the name of the wine – which is actually a sweet sherry that is made in Spain. The grapes partially dry on the vine. After they are picked, they lay on mats in the sun for a week or two. The result is basically raisins. With almost all of the water gone, the sugar is very concentrated. Then instead of allowing the yeast to eat all of the sugar and turn it into alcohol, the winemaker stops the fermentation with lots of sugar remaining in the wine. Don’t worry about missing the alcohol though because the fermentation is actually stopped by adding alcohol that kills the yeasts. The result is a wine high in sugar AND with ~ 17% abv. Happy Happy Holidays!!! And what does it taste like? Well, raisins of course!!! Plus there are flavors of other dried fruits like fig, mixed with caramel, chocolate, nuts, etc. You can see why this sweet, lush wine would be delicious with desserts made of nuts and fruits. 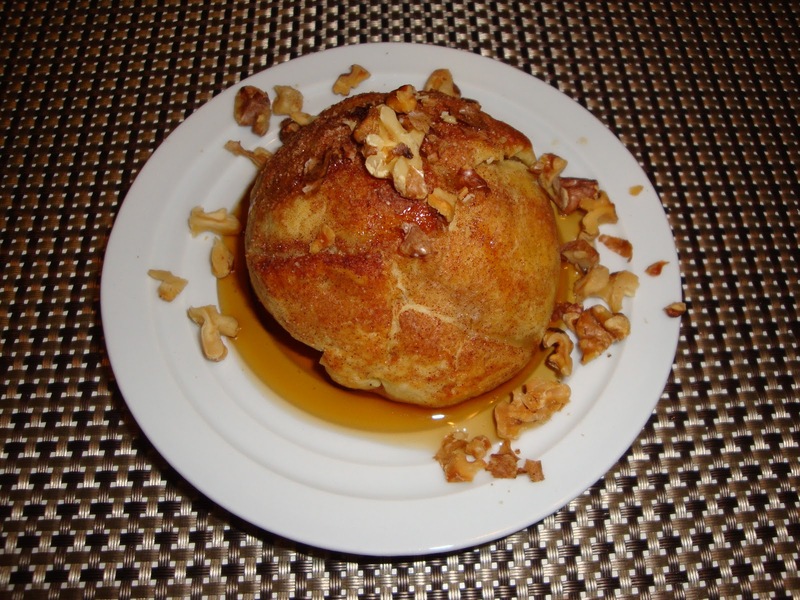 We like it with pecan bars and it also brings out the nuttiness in Tasting Pour’s baked apple dumplings. You might also try it with fruit cake, minced meat pies, or simply a fig Newton. Prices vary but a good 375 ml bottle can be found in the $30 range and will keep at least 2-3 months after opening. Simple enough for a weeknight and elegant enough to entertain. It easily scales down for a romantic seating for two or up for a dinner party. Bake while enjoying the main course and enjoy the tantalizing aroma of baked cinnamon sugar signaling time for dessert. Sprinkle cinnamon and nutmeg over sugar and top with apple half. Brush edges of dough with egg white. Bring sides of dough up and pinch to seal. Pinch dough together completely to seal each apple half. Place on cookie sheet. Brush with egg white and sprinkle with cinnamon sugar. Bake at 400 for approx. 30 minutes or until golden brown. Pour small pool of warmed maple syrup on each plate. Top with baked apple. Garnish with nuts. What are some of your favorite holiday desserts and dessert wines? Leave a comment or email.